Biolase Epic-X excels as a clinical instrument for reshaping and redesigning your smile by means of gingivectomies and crown lenghtenings, hemostasis with surgical procedures, scalpel free and stitch free frenectomies, non-surgical periodontal treatments, disinfection and decontaminitation with root canal treatments, teeth whitening and pain therapy. Crown Lengthening for "Gummy Smiles"
Adjusting tooth length through “crown lengthening” procedures is a straightforward, easy procedure leaving patients beaming with a dazzling new smile. The differences between a laser and a scalpel when used for oral surgical procedures is stark. While scalpels have a long list of physiological and psychological effects on the patient, Biolase lasers enable you to quickly cut, sculpt or modify soft tissue when needed. During many procedures, managing the soft tissue can be problematic if it begins to bleed or respond unpredictably. With Biolase lasers, achieving hemostasis and controlling the surgical zone are as easy as tapping a pre-set on the laser’s touch screen. We perform patient-friendly, bladeless, bloodless, sutureless frenectomies and improve the patient and parent experiences. With the addition of minimally invasive Biolase lasers into the non-surgical perio regimen, a Dental Hygienist can also offer the benefits of non-surgical laser therapy to their patients while providing state-of-the-art care. The Epic X diode laser is an adjunct to traditional scaling and root planing and can reduce post-treatment bleeding. 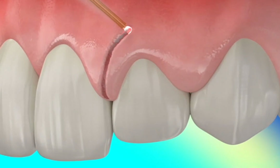 Biolase lasers effectively fight root canal (endodontic) infection and can perform root canal disinfection, cleaning, and decontamination prior to obturation, pulpotomy and pulp extirpation, and smear layer removal in the canal. Research has shown that Epic lasers are capable of delivering 6-12 shades (varies by patient) with less than 20 minutes of gel-to-tooth contact time. The laser energy from an Epic laser interacts with chromophores in the proprietary laser-activated gel to accelerate the in-office whitening procedure. Using a special handpiece attachment, the Epic laser transforms from an award-winning surgical and whitening device to a fully capable solution for reducing and managing oral, TMJ and maxillofacial pain. For patients with cold sores or canker sores, Epic X offers pain relief and promotes healing. A biopsy is the removal of a tissue sample from a living body with the objective of providing the pathologist with a representative, viable specimen for histopathologic interpretation and diagnosis. This approach is used for all tissues of the body, including those of the oral cavity, where a wide spectrum of disease processes may present. We use he Epic X Biolase Diode Laser to do oral biopies. Gingival hyperpigmentation is a common esthetical concern in patients with gummy smile or excessive gingival display. Laser ablation has been recognized recently as the most effective, pleasant and reliable technique.